As notified Motorola has unveiled its new master piece, the Motorola Motocubo A45, an amazing sleek sliding phone with high end user friendly features and latest technology. This hi-tech phone has currently hit the Brazilian markets. The most sensational features of this fully fledged cell phone is that it’s made up of recycled plastic which makes the phone a eco-friendly. Motorola Motocubo A45 comes with an amazing battery life of upto 350 hours and talk time of upto 8 hours 30 minutes. 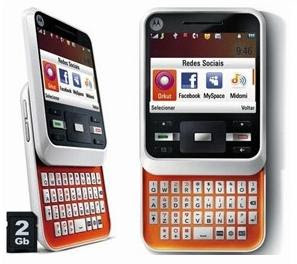 This eco-friendly slider phone from Motorola is priced at 290USD approx.